Steven Kamara is a diligent and compassionate physician specializing in internal medicine. 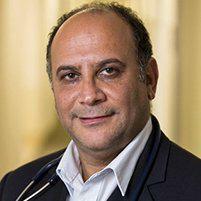 Dr. Kamara speaks English, Spanish, Hebrew, Farsi, and Arabic fluently. He attended the Albert Einstein College of Medicine to receive his medical degree and completed his postdoctoral education at the Cedars Sinai Medical Center in Los Angeles. Dr. Kamara treats patients at his private practice in Los Angeles and also takes care of patients in the hospital at Cedars Sinai Medical Center and Olympia Hospital. He is a Medical Director at nursing facilities and also takes care of patients at the nursing home. Dr. Kamara's treats a wide range of patients dealing with a variety of conditions and ailments. His services include but are not limited to pre-surgery checkups, vaccines, and annual physicals as well as medical examinations for athletes, commercial and vessel drivers, overseas workers, pilots, police officers, and firemen. "Dr. Kamara is a compassionate and caring doctor. I have never felt rushed, he listens and offers great care. His practice brings back the old days of feeling secure..."
Dr. Kamara's comprehensive approach to wellness takes into account both the physical and psychological aspects of our bodies. He believes in treating each patient has a whole, emphasizing the importance of preventative care and works with each individual patient to find the root of their ailments and to feel their best. "I love Dr.Kamara! He is always there for me, always professional and knowledgeable. As soon as he enters the office, or the hospital room I am in, I feel better!" Dr. Kamara is very professional yet personal in his manner. I appreciate his follow through very much. His office staff are gracious and very competent. They give me great confidence in the care I receive."